It didn’t take long for Princess Mary to win the hearts of many across the globe for her warm and caring nature, but the Aussie-born royal has also impressed with her fabulous style since joining the Danish royal family. The mother-of-four wowed onlookers this week by stepping out in two stunning outfits in one day for a busy round of royal engagements. Prince Frederik’s wife seamlessly transitioned from a pretty casual outfit to more elegant evening attire on Wednesday as she attended two important events. Mary, 47, sported a gorgeous pink print skirt paired with a white turtle-neck sweater during the day for a visit to a local school in Denmark’s capital of Copenhagen. The beautiful princess was all smiles for the meeting with children where she addressed the problem of bullying and how to create a better community. In further photos shared by the royal family, Mary is seen happily engaging with the kids who are working to create a more friendly environment. 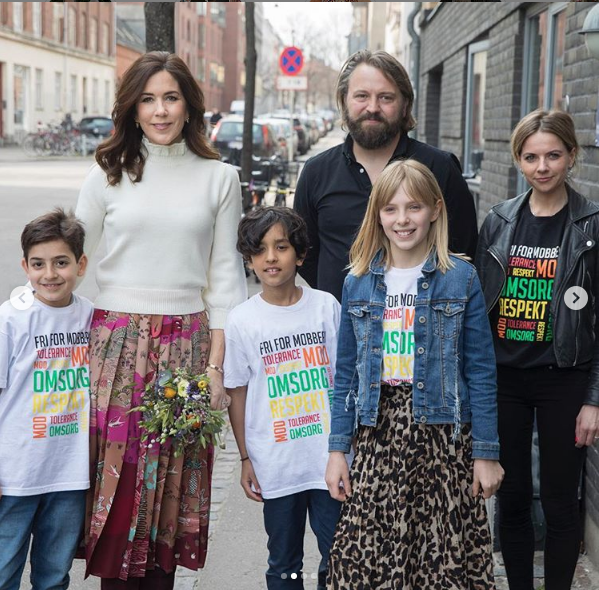 “HRH The Crown Princess and 220 children from the leisure institution at Vibenshus School were singing today, as the Mary Foundation’s Free of Bullying and HipSomHap presented a new song that is about being a good companion on the web,” the Danish royal family wrote in a post on Instagram. The song is part of a number of new tools created by the foundation for educators to help strengthen children’s social skills in the moving digital world. Later that day, Mary changed into a more formal outfit for the annual Danish Rainbow Award show, also in Copenhagen. The princess opted for a pale pink, shiny blouse for the evening event, which she matched with a pair of similarly coloured wide-leg trousers. The beautiful royal added a few more curls to her look, while she sported some lovely silver earrings and a thin silver bracelet. The awards night, held at The Circus Building, is an annual, non-profit event held by volunteers in celebration of individuals and companies that in the past year have made a positive and significant difference in the LGBT community. Are you a fan of Princess Mary? Do you like her style?